During this past Christmas season on campus, in the midst of the wreaths, trees and lights, there were some decorations that stood out. These blue silhouettes of people, or blue shadows, represented refugees and migrants on their journeys. 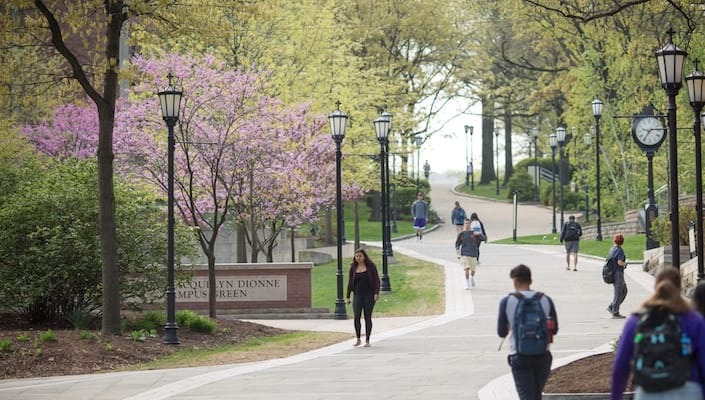 They were found in several different buildings around campus, including DeNaples, Leahy Hall, the Loyola Science Center, and Brennan Hall. Each building had a group or “family” of three shadows. 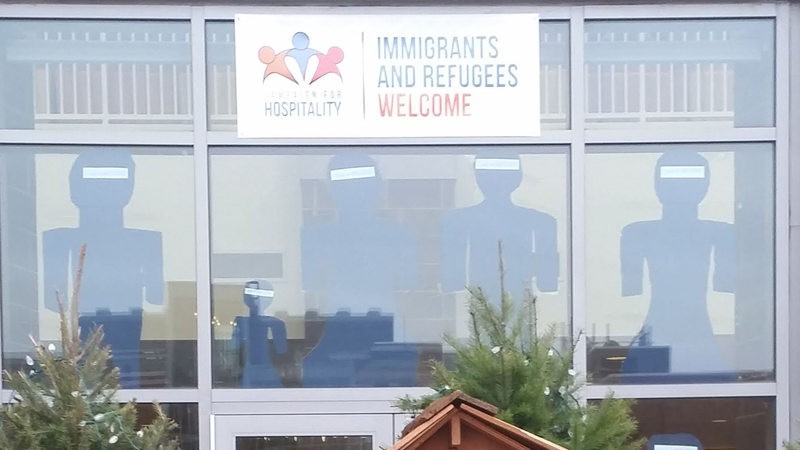 A “Welcome Refugees” banner also hung above the Nativity Scene inside the windows of DeNaples with a collection of blue shadows, a reminder that the members of the Holy Family were refugees. This project was organized by the Catholic Relief Services (CRS) Student Club, named for the international Catholic relief and development agency of the United States Conference of Catholic Bishops. The club focuses on social justice issues, advocacy, solidarity, and other guiding principles of the CRS organization. A major focal point for the club this year is migration, which corresponds with current events at the United States-Mexico border and the migrant caravan. The blue shadows were placed around campus to draw attention to migration, and the journeys of refugees and migrants worldwide during this season of love and hope. Each group of shadows was accompanied by the story of a real migrant’s journey to the United States. The stories were taken down at the Kino Border Initiative, an organization on the United States-Mexico border that is dedicated to promoting “US/Mexico border and immigration policies that affirm the dignity of the human person and a spirit of bi-national solidarity” through accompaniment, education, advocacy, and collaboration (Kinoborderinitiative.org). Every year, Campus Ministries’ International Service Program sends a group of students and chaperones to the Kino Border Initiative, where the group has the opportunity to speak with migrants and hear their stories first-hand. Upon returning home, the group is encouraged to advocate for the migrants and share their stories. Students have had positive reactions and increased interest in the blue shadows. For those who hope to learn more, the CRS club will be having a refugee simulation on February 22 from 5-7 p.m. in the McIlhenny Ballroom of the DeNaples Student Center to help students “walk in the shoes of refugees.” We hope you can join us!